A subset of smart locks made by Lockstate have been bricked after an update. The smart lock vendor is part of Airbnb’s Host Assist program, and integrates with the accommodation rental platform so, for instance, hosts can automatically generate and email one-time codes for their guests to use during check-in. TechCrunch was alerted to the problem by a Lockstate customer, Ruffin Prevost, who forwarded us the email he had received from the company informing him of the “fatal error” following a software update. Two models of Lockstate smart lock are apparently affected, one of which currently retails for $469. 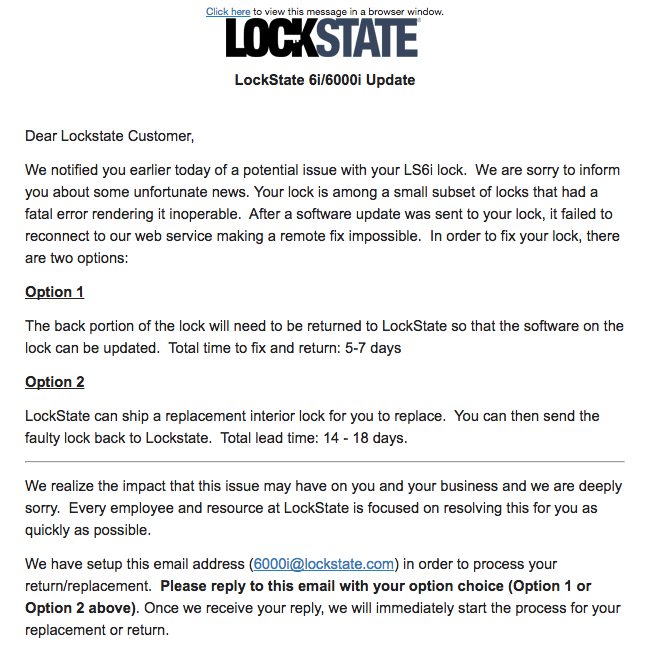 In the mass mailer email, which begins “Dear Lockstate customer” and summarizes its contents as an “update” pertaining to LockState 6i/6000i, affected customers are asked to wait as long as 18 days for a full replacement. Or up to a week if they choose to remove and send the back portion of the lock to the company for repair. The email adds that Lockstate will pay for shipping and return “within the continental US”. And will provide affected customers with “1 year of free service for the LockState Connect Portal for these locks”. “We hope that you will give us a chance to regain your trust,” it concludes. Airbnb offers a $50 discount code for purchasing integrated Lockstate products in its Host Assist program — where it describes the recommended smart locks as “revolutionary” and capable of withstanding “high usage”. Prevost, an Airbnb host, said he owns two LockState 6i locks, which are used on two interior apartment doors that are rented out on Airbnb’s platform. “The firmware killed the locks mid-morning on Monday, when we happened to be cleaning rooms. We keep keys to both locks in a mechanical lockbox in the hallway in case of dead batteries or failures. So even though the keypads weren’t working, we could still use those keys to open, close and lock the doors manually,” he told TechCrunch. As well as being understandably annoyed about the update bricking both locks, Prevost is critical of how the company has handled customer outreach and support. Several affected customers, including Prevost, took to Twitter to try to figure out how widespread the problem was. Prevost says he was eventually able to speak to a marketing manager at Lockstate, who told him about eight per cent (or around 500) of the company’s locks are affected. “The company initially told me they had no extra locks to send me for a replacement and I’d have to wait up to 20 days. After word started getting around late Friday about all this, the marketing director left me a message that they had now gotten some extra locks somehow. But I had already sent back parts of both my locks,” he added. CUSTOMER AGREES THAT LOCKSTATE AND ITS LICENSORS AND SUPPLIERS PROVIDE THE SERVICE AND THE SOFTWARE ON AN “AS IS” BASIS. NEITHER LOCKSTATE NOR ITS LICENSORS OR SUPPLIERS MAKE ANY WARRANTIES WITH RESPECT TO THE PERFORMANCE OF THE SERVICE OR THE SOFTWARE AND/OR ANY INFORMATION OR SERVICES PROVIDED IN CONNECTION WITH THIS AGREEMENT, WHETHER EXPRESS, IMPLIED, STATUTORY OR OTHERWISE, AND LOCKSTATE ON BEHALF OF ITSELF AND ITS LICENSORS AND SUPPLIERS EXPRESSLY DISCLAIM ALL OTHER WARRANTIES, INCLUDING BUT NOT LIMITED TO THE IMPLIED WARRANTIES OF NON-INFRINGEMENT OF THIRD PARTY RIGHTS, MERCHANTABILITY AND FITNESS FOR A PARTICULAR PURPOSE. So, as is typical with Internet-connected devices, the buyer remains at the ongoing mercy of the company whose digital service is necessary to enable the paid-for hardware to function as intended — in this case for access control. And also — as Prevost was using it — integrated into his Airbnb host customer service workflow with the aim of making it easier for him to manage guests by generating and sending one-time access codes ahead of time. So faced with two doors having unresponsive locks for at least a week, what did Prevost do? A lot of extra work, basically — manually replacing both dud locks with two non-Internet-connected-keypad alternatives that he had previously been using, and reprogramming those with the codes previously generated by the (now) dumb Lockstate locks. “Our Airbnb guests were never inconvenienced,” he added. Clearly the same could not be said of Prevost. “At this point I’ve ‘de-integrated’ the locks from Airbnb so the cloud isn’t generating new codes for those locks. We’ll see where things stand at year’s end when most of those pre-programmed guests have cycled through,” he added. Another lock-in evidently discouraging Prevost from switching to an alternative smart (or dumb) lock is a physical/aesthetic consideration — with specific holes having had to be drilled in the doors to accommodate Lockstate’s product. “Removing the locks leaves a big hole that I have to patch or cover with some other similar size/shape lock,” he noted. Prevost says he’s now expecting the reprogrammed backplates back from Lockstate this week — having sent them to the company on Thursday. “It still hasn’t clearly explained publicly what happened, why, or how they will ensure this won’t happen again. And word is getting out anyway, so any efforts to keep this under wraps have not worked, and have only been a disservice to the customer,” he added. As a kicker, it’s not the first problem Prevost has experienced with Lockstate’s products either, after the initial locks he bought a year ago arrived with defective hardware. The locks that were affected were an earlier version of our LS-6i lock — the 6000i model. A feature update for a different set of locks accidentally included this subset of locks from a first generation 6000i WiFi lock we stopped making a year ago. Five hundreds customers, representing around five percent of our WiFi locks and less than one percent of our lock owners were affected. We reached out immediately to them via email and updated the lock management portal — LockState Connect — with a message to notify those 500 customers. We began working one-by-one to help each customer. The options included mailing in lock or board for immediate reflash or having a replacement sent to them. In some concentrated areas, we even sent technicians out to flash the locks on-site. The delay in shipping new second generation locks is because we have been on back order for this popular lock, but we expedited those from the factory to fulfill. Owners were not stranded with a non-working lock. This keypad lock comes with an emergency set of keys that can be used in case of emergency. This has been the way most owners have continued using the lock. Many locks are already back online using the management and monitoring features after repair or replacement. We have a resolution in place for nearly all the other customers with new locks starting to be shipped out over the last few days.